Hello you wonderful readers, I am Jamie, your postman! Well, not your postman, unless you happen to be from Beach City. And if you are, I apologize if your mail was slightly delayed today, as I was up late last night agonizing over this very guest contribution to this very blog! As you may know, every postal carrier swears the oath, "Neither snow nor rain nor heat nor gloom of night stays these couriers from the swift completion of their appointed rounds." But unfortunately, the vastness of space does. Or so I thought! 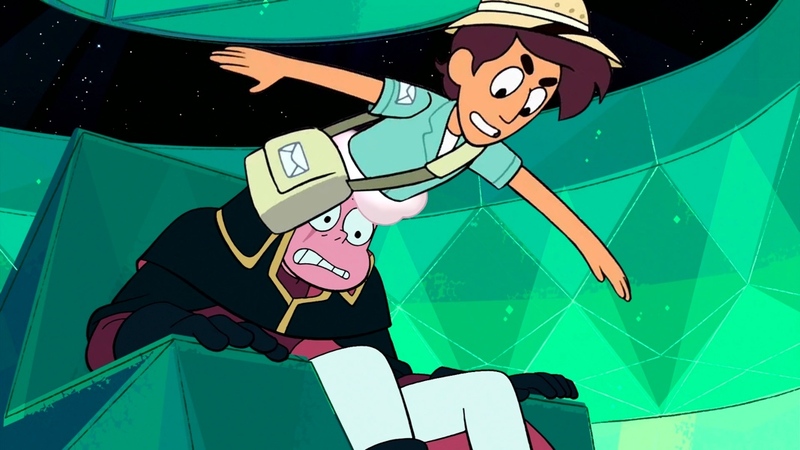 The mail for our lost Lars Barriga had been piling up in the Undeliverables bin, but then Steven Universe, the precocious magical youth of my hometown, revealed to us the secret interdimensional portal through the mane of his curious pink feline friend, Lion! And by "us," I mean me. Barb was on assignment yesterday, saying something about a special mail delivery to Empire City. Lion and I have always gotten along famously. We have an understanding. The two of us alone know the burden of delivering sometimes-magical objects safely to their destination! And so it is wonderfully poetic that Lion should be the one to deliver me and my cargo safely across the distance of space and time. I must admit, I was initially terrified. During the same event that took Lars away from us, I wound up literally trapped inside the body of an extraterrestrial being. Seeing Steven's hand pass into the mane of Lion brought me back to that horrific day. Of being unable to move and feeling nothing but pressure closing in on all sides. But the mail must go through! After a pep talk from Steven as he held the portal open, I closed my eyes, and with a mighty yell, threw myself into the cotton candy abyss. The trip, friends, was absolutely surreal. This world between two worlds manifested as a pair of arboreous islands in a sea of pink hair. I found I could not draw breath in this world and had to scramble for the exit. Triumphantly, I emerged, overflowing mail sack on my shoulder, through the head of the most sought-after Undeliverable in the entire postal system. Turns out it was mostly junk mail. Outdated solicitations for donations to former Mayor Dewey's re-election campaign, a stack of unpaid mobile phone bills stretching back six months, Flyers for concerts already passed, angry notices from The Big Donut's corporate offices about not showing up for work, etcetera. Ah well. The postman can't promise you good news; he can only deliver it to you on time. Or, well, as quickly as he could, given the circumstances. But it was all worth it, faithful readers. For after making that mail delivery, my eyes beheld the beauty and radiance of the amazing Rhodonite. Lovely, from her salt-and-pepper two-toned coiffure, to her four eyes, two inquisitive and two inviting, to her four arms, two strong and two graceful, to her powerful legs, all the way to her dainty feet. She is everything I saw in Garnet and more. She regarded me in her soft voice, unsure of what to make of me. I tried to work up the nerve to speak, but lost it when the small, orange gem announced that I would be arriving. So I merely bowed and took my leave. I simply must see her again! And so, dear reader, I implore you: please write letters to Lars. The next mail delivery to the bridge of the Sun Incinerator is at 7:30 PM ET/PT (it's when Lion would be available) on Cartoon Network. If you don't have sufficient postage, don't worry! We've got streams and downloads after the break.